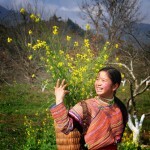 Northwest Vietnam offers intriguing and beautiful cultures, spectacular sceneries, wonderful people, rich custom and tradition. We walk and hike through particularly picturesque areas, cycle around beautiful villages, kayak along the river and come into some Thai, Muong, Lu, Lao, Dzay minority villages. Departing from Hanoi we drive to Pu Luong via Mai Chau. Pu Luong is an area of outstanding beauty, cultural interest and high biodiversity value stretching from Mai Chau in the northwest, to Cuc Phuong National Park in the south east. The region is blessed with the rich forest, limestone panoramas, magnificent rice terraces and breathtaking scenery. After 4 hours driving, we arrive at Mai Chau, stopping to have lunch and then we keep driving 22km further to Pu Luong where we start to trek about 3 hours to Hang village which is the home to White Thai ethnic minority people. We spend our night at the local house. Before dinner, we stroll around to the village to observe the daily life activities of the locals. After our breakfast, we say goodbye to the host and start to trek a couple of hour along the simply awesome scenery and pass through several Thai and Muong villages. This is followed by a leisurely bicycle ride through the spectacular area before arriving at Black River for our leisurely boat ride along this beautiful river, which is essential for providing water to the largest hydro power electric in the North of Vietnam as well as fishing and agriculture. We then approach Xom Moi village which is situate by the river and home to Muong tribe. Tonight, we spend our night at the local house for one more night. After having breakfast, we have an hour to do kayaking along the river to see the great view along the bank of river and meet the locals who fish on this river. And then we drive about 3 hours to Son La province through tea plantations, hills and mountains. En route we stop to visit the local market and walk around some remote villages, home to Black Thai people. After check in your hotel, we will have a short walk to visit the old French Prison and Museum. Tonight you will sleep at a comfortable hotel in Son La town. We continue our journey by driving to Lai Chau Province which is located in a peaceful place surrounded by mountains, hills and villages. In the afternoon we have a short walk to nearby villages. Returning to the hotel in the late afternoon, you will stay overnight at the hotel. Limestone mountains, verdant hills, and spectacular valleys along the way to Sapa are our base for soaking up breathtaking scenery and learning about the way of local life. Arriving at Binh Lu town at noon, we stop to have lunch before walking about 7km to visit the Lu and Laos tribes who are preserved from tourist and black teeth because of betel nut eating habit. This is followed by driving to Love Waterfall which is located in Hoang Lien National Park. We have a 2km walk along Golden Stream of National Park to reach Love Waterfall which is really romantic one, especially, it has natural swimming pool at the bottom so you can swim there in the summer time. After that we walk back the car to drive to Sapa. You stay overnight in Sapa town. You have breakfast at the hotel or local restaurant before walking about 12km along the mountain trails or main road to visit Suoi Ho, Matra and Taphin villages which are inhabited by Black Hmong and Red Dzao tribes. Along the way we can come in some schools as well as tribal houses to have experience of local Sapa life. Moreover, the landscape, culture, custom and tradition of Black Hmong tribe of Suoi Ho and Matra villages are preserved from tourists so you can study the raw things here. Picnic lunch will be served on the way at the home stay in Taphin village before being transported to Sapa by car. You can have shower and dinner before going to train station to catch the night train to Hanoi.